WE HAD A WONDERFUL CONTEST AND I LOVED ALL THE IMAGES… THANK YOU TO ALL 94 ENTRIES FOR TAKING THE TIME TO ENTER. Link to Chagy’s Facebook page stop by and congratulate him! 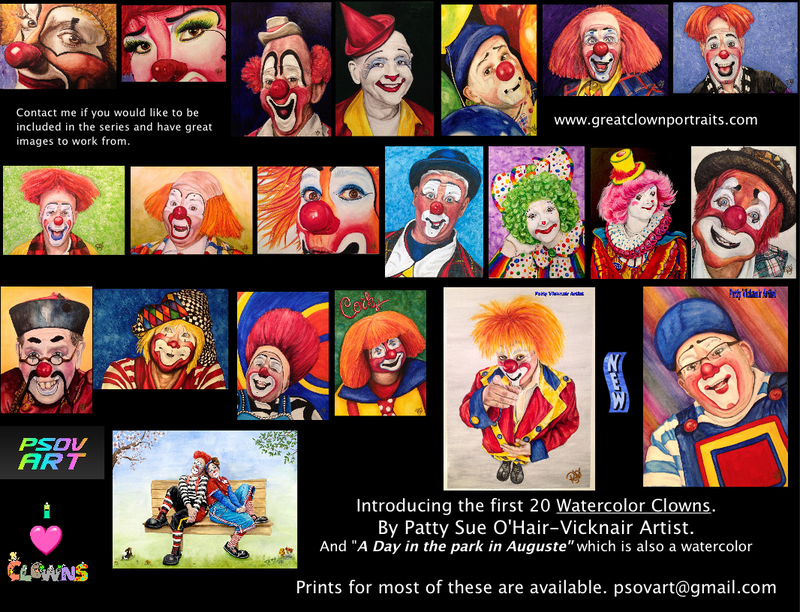 Pedalito will win one amazing 9 X 12 watercolor clown portrait and TWO-9 X 12 prints on fine art paper for his friends. Link to Daniel Flores Facebook page stop by and congratulate him! Oopsie Daisie The Clown will win one amazing 9 X 12 watercolor clown portrait and One -9 X 12 print on fine art paper for her friend. Link to Oopsie Daisie The Clowns Facebook page Stop by and congratulate her! I will be contacting each of you to discuss the image and figure out the right layout for the 9 X 12 format. Congratulations! I am currently working on a big painting but as soon as I am finished I will be getting started.